Growing the OGS FamilyEric Auers Cloke was born to OGS Communications Coordinator, Jenn Miyakawa Cloke, and her husband Alex Cloke on December 19, 2014.Congratulations & Welcome Eric. Organic Growers School is a recipient of the USDA’s National Institute of Food & Agriculture, NIFA, which recently announced more than $18 million in grants to educate, mentor, and enhance the sustainability of the next generation of farmers, through the Beginning Farmer & Rancher Development Program. OGS is partnering with Southern Appalachian Highlands Conservancy to develop a region-wide farmer training program. For anyone who has registered for OGS events recently, you may have interacted with Vaidila Satvika, our Spring Conference Assistant. Vaidila is in charge of volunteers, registration, and supporting Meredith Leigh, our Conference Coordinator in many aspects of Spring Conference planning. Cameron Farlow, the OGS Farmer Programs Coordinator goes full time thanks to the above mentioned USDA grant. 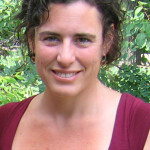 She will be coordinating CRAFT in 2015 as well as developing a whole-farm Farmer Training Program to serve area farmers. We are thrilled to have Cameron as a full-time staff member. Forty-five beginner to advanced home-grown revolutionaries gathered in a day-long workshop with author, teacher, permaculturalist, Peter Bane on February 8th. Attendees called it outstanding and excellent, and asked that Peter return for a two-day workshop sometime soon.